The largest meeting of the Chicago Teachers Union of the 21st Century (and perhaps in history) voted unanimously on August 30, 2012, to strike Chicago's public schools unless an acceptable contract is reached during the current negotiations by September 10, 2012. The vote to strike was taken on a motion from the union's Executive Board during the huge meeting, which took place at the Operating Engineers union hall on Chicago's South Side after school on August 30. All Chicago public schools teachers are now at work, with the 241 so-called "Track E" ("year round") schools in full session with their students, and the remainder of the schools holding daily "PD" (professional development) days. 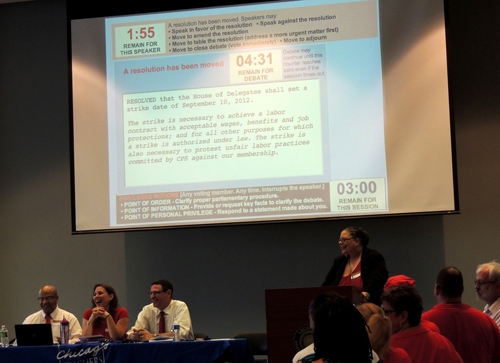 The resolution to strike appeared on the big screen above the union's officers during the debate. It read: "RESOLVED that the House of Delegate shall set a strike date of September 10, 2012. The strike is necessary to achieve a labor contract with acceptable wages, benefits and job protections; and for all other purposes for which a strike is authorized under law. The strike is also necessary to protest unfair labor practices committed by CPS against out membership." Above, at the main table, were the CTU officers (left to right): Recording Secretary Michael Brunson; Financial Secretary Kristine Mayle; Vice President Jesse Sharkey; and (at the podium) President Karen Lewis. Substance photo by George N. Schmidt. The House of Delegates, which has been growing in size as the union rebuilt itself since the election of President Karen Lewis and the CORE slate in June 2010, now has more than 800 members, at least one representing every public school in Chicago, with others representing citywide and PSRP groups. The unanimous vote took place following the introduction of the resolution by President Lewis and dozens of speakers in favor of it. When the chair called for the "Yes" votes the hall thundered. When the call came for the "No" votes there was not a sound. After a warning that union teachers should not trust the corporate media to report the news ("the only way you will know the facts is from the union" Lewis stated) the delegates and other union members (there were more than 100 "visitors" — union members who are not elected delegates and a handful of children of delegates) steamed out of the large hall and into the sunshine to pick up picket signs and lawn signs in the final preparations for the first CTU strike in a quarter century. Specifically, the resolution that passed read: "RESOLVED that the House of Delegate shall set a strike date of September 10, 2012. The strike is necessary to achieve a labor contract with acceptable wages, benefits and job protections; and for all other purposes for which a strike is authorized under law. The strike is also necessary to protest unfair labor practices committed by CPS against out membership." The special meeting of the 30,000-member union's House of Delegates also approved a resolution asking the union members in the other unions working for CPS to wear red in solidarity with the CTU strike. Three unions — the operating engineers; the service employees; and the hotel and restaurant workers — were forced into early contract settlements by the Emanuel administration, which threatened to privatize their work if they did not enter into the agreements. The contracts for the other unions contain no strike clauses, and the unions' officers have advised their members that by law they cannot honor the CTU's picket lines. The vote followed reports from each of the union's four officers outlining the most recent refusals of the Board of Education to negotiate seriously with the third largest K-12 teacher union in the USA. According to the reports, since the opening of the "Track E" schools in early August, CPS officials and principals have gone out of their way to continue to insult the union's members and violate the contract, despite attempts by CPS officials to claim that negotiations were going well. The insults included such ridiculous things as principals scheduling teachers for "lunch" at 8:45 in the morning and newly appointed principals (in this case, at Social Justice High School) firing veteran teachers (and union activists) claiming that they had the power to do so because of some vague "reorganization" of the school. (See related articles in this Substance). Members of the CTU House of Delegates, who filled the cavernous meeting hall at the Operating Engineers Union on August 30, 2012, cheered and raised their fists in solidarity after voting unanimously to strike the nation's third largest school system on September 10, 2012 unless an acceptable contract is reached by the union's negotiating team. CTU President Karen Lewis can be seen in the right corner standing at the podium following the vote. Substance photo by George N. Schmidt.More than 20 speakers (including this reporter, who is a delegate for retired teachers) spoke in favor of the resolution, intoning, one after another, for example, "Whitney Young High School is ready to strike" (Jay Rehak, delegate from Whitney Young). During their reports, the union's officers reminded the delegates that they had been in negotiations since November 2011, and that only after various actions by the union had the Board of Education's negotiators even began to settle on the smallest matters. A brief settlement on the rehiring of teachers who had lost their jobs as part of the "Longer School Day" for the Track E schools was rescinded for the general contract despite press reports that it foreshadowed further cooperation between the two sides. The Board of Education is paying an outside law firm hundreds of thousands of dollars per month to handle negotiations, while the Board's quarter million dollar "Chief Executive Officer" has yet to sit down at the bargaining table. Examples of the bad faith being shown by the Board of Education were given in the officers' reports and in statements from the floor by delegates. As the meeting progressed, the tone of the delegates became more and more angry. By August 30, the "Track R" teachers and other union members had been working for four days (all for "Professional Development") while the "Track E" ("year round") schools had been meeting with their students. 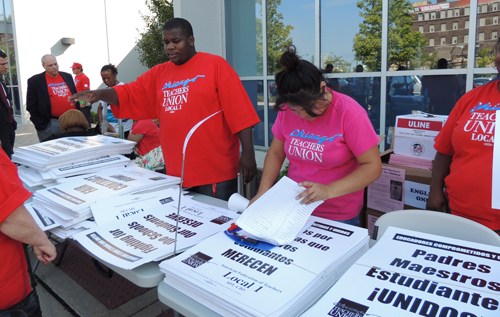 CTU staff have distributed more than 25,000 picket signs and lawn signs during the last week of August. Above, the union staff works outside the House of Delegates meeting to distribute signs to delegates while (far left) CTU Vice President Jesse Sharkey discusses union issues with delegates. Substance photo by George N. Schmidt.One of the issues that has teachers and other professionals in the system is the fact that most of the highest paid school officials in Chicago in 2012 are outsiders with no Chicago teaching experience, but paid the highest salaries in the history of the city's public schools. Jean-Claude Brizard (the "Chief Executive Officer") is being paid $250,000 per year, but has never taught in Chicago (he came to Chicago from Rochester New York). Barbara Byrd Bennett (the "Chief Education Officer") is being paid $200,000 per year, but has never taught in Chicago (she came to Chicago from Detroit). Jennifer Cheatham (the "Chief Instruction Officer") is being paid $190,000 per year, but has never taught in Chicago (she came to Chicago from California, where she spent most of her time as a consultant, not as a teacher or principal). The CTU strike is a national teach-in for all Americans. I am advocating for voting rights in another context, so I would like to know more about the technicalities of the vote. The 75%law---% of what? votes? membership? The 90% vote--of what? votes? membership? The 98% vote--actual ballots cast? What were the mechanisms of balloting? Although the vote was truly amazing, I would not want it to be a model to redefine what a majority--or super-majority--is. Except for PR purposes, a vote weighed against the number of "possible" votes rather than actual votes cast is too high a bar. While I applaud the CTU for flying over that bar, I don't want that model to be used to redefine what a majority is, making voting an exercise in futility.